Looks like the garden hose goes thru the plywood and is ready for any fire incident. Seriously, was a suitable box and cover out of the budget? Not only was a suitable box out of the budget, it was beyond the imagination of the installer. I see this method all too often. Truth be told, the lack of a box probably the one of the lesser violations. First, notice how the cable goes through the wood panel.Did you pause to wonder why? I'll take a guess here, and say this house is an older home, one built without laundry facilities. My own 1957 home was built with only a washer hook-up in the carport, and no provision for dryer. Folks often decide to move the laundry a porch, or indoors, and add a dryer. The dryer will use a surface-mounted, cord connected receptacle like this: http://img.rakuten.com/PIC/16310526/0/1/500/16310526.jpg It will be fed by a cord passing through a hole in the floor. 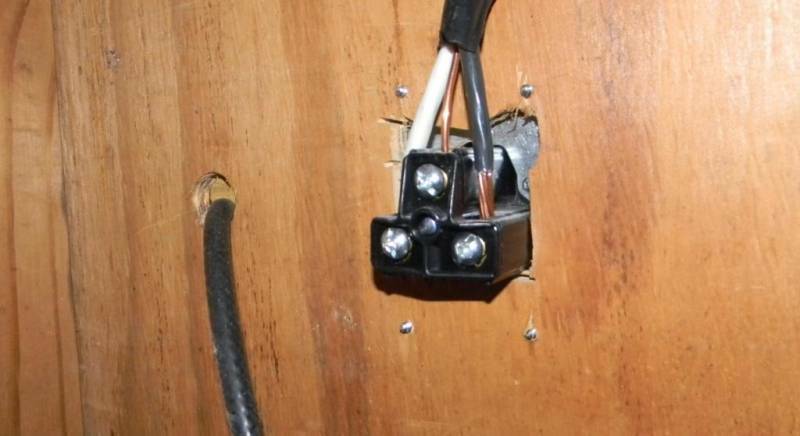 IMO, the cord to be in the wall cavity, and secured (as this example is surely not secured at all). Follow the cord, and you will find it tied into one of the existing 240v lines- the power for the water heater range. I often find all three tied into the 30-amp water heater circuit. The connections are made without boxes, the so-called "flying splice." While you're under the house, look to the drain line for the washer and the dryer vent. Both commonly just dump their contents under the house. IMHO, I maintain that the only proper materials to use for mounting receptacle are a DEEP 4-11 box, with either a double mud ring (recessed mounting) or industrial cover (surface mount) and a proper 2-screw cable clamp. No other combination gives you enough space to work with the wires. Usually, though, the an will cram it into a plastic box, remove the "clamp," and push his "pigtails" back into the wall cavity. I love it! It makes all my work look so much better. Too bad drywall isn't strong enough to hold the screws or they could have saved money and used drywall. I think that's a welder plug and an air hose. Maybe they have different rules for garages. Ah, a welder outlet & air hose. 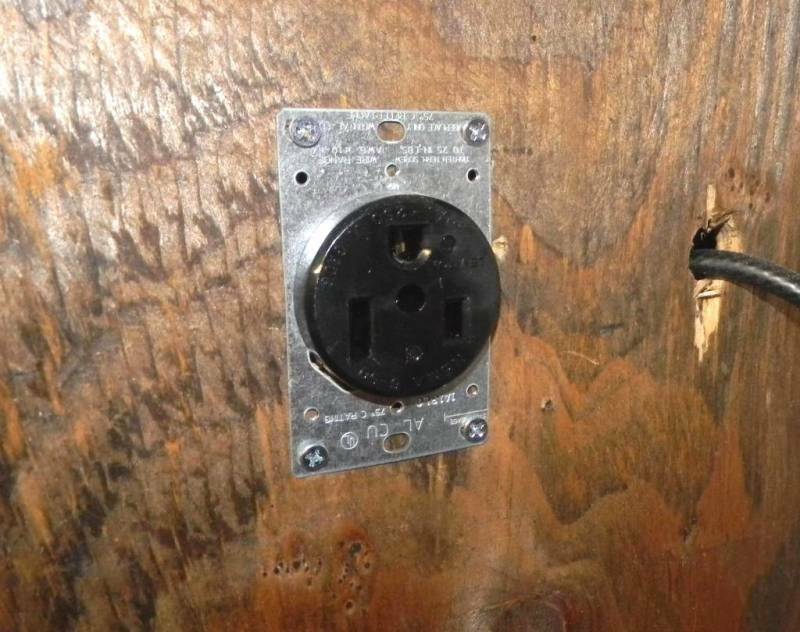 I can't read the plug plate, but 120 volt, (H-N-G). I think Reno is on the right track, dryer outlet, be it 120 or 240 the 'lectrician will make it work. A welder plug and an air hose? I'm thinking it could be for a plasma cutter. Looks to be a 50A 250V receptacle, common type used for welders,my Lincoln buzz box & MillerMatic 251 MIG welder both came w/ that configuration plug, that "shiner" on the black conductor is really nice, but it goes with the rest of the poor workmanship as noted above. I think the "hose" is actually RG-6 coax. The diameter looks about right. When I updated my wife's grandmother's house it was full of examples like that. Want a ceiling light? Punch a hole, run the Romex and use wood screws to secure the fixture.